PolitriX & Tings: Ignore Bob Woodward ... He's just selling books !! Ignore Bob Woodward ... He's just selling books !! 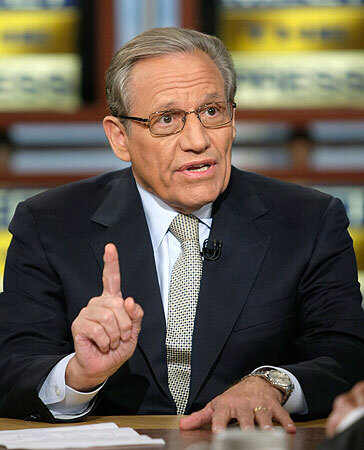 In "WTF" news this week, notable journalist Bob Woodward of "Watergate" fame, came out (no not like that) and said that there is the possibility of a "Barack Obama - Hillary Clinton" ticket in 2012. Hiding behind the infamous "sources say" disclaimer, Woodward recently said it was "on the table" for Hillary Clinton to replace Joe Biden on the 2012 Democratic Presidential ticket. WTF Bob ?? Can we get through the midterm election in a few weeks first before stirring up the pot of division once again in the Democratic party ? Although the White House, Hillary associates, and Hillary herself have discredited this story as being ludicrous and as one source puts it, "the dumbest thing I've ever heard. ", Woodward still holds on to the "I wouldn't eliminate it" as a possibility disclaimer. Well, HELL, I wouldn't eliminate me defeating Jamaican 100 meter World Record holder Usain Bolt in a footrace either, but it's NOT EXACTLY LIKELY to happen. The only thing that I can conclude from this WTF, out of left-field supposition is that Bob is simply trying to sell books. With the release of his new book , Obama's Wars (you know, the 2 wars in Iraq and Afghanistan that Obama himself STARTED ), concerning the division among the Civilian and Military leadership about strategy for the 2 ongoing Middle East wars, Mr. Woodward has been all over the tube doing all sorts of interviews and what would get people talking more than more "Obama-Clinton" drama, after their historic and divisive Democratic Primary fight a couple years ago ? Not that Bob exactly needs the publicity and the extra $$ that it's bound to bring in, but in regard to talk of a "Barack-Hillary" Presidential ticket, I'll simply say "Ignore Bob ... He's just selling books !!"